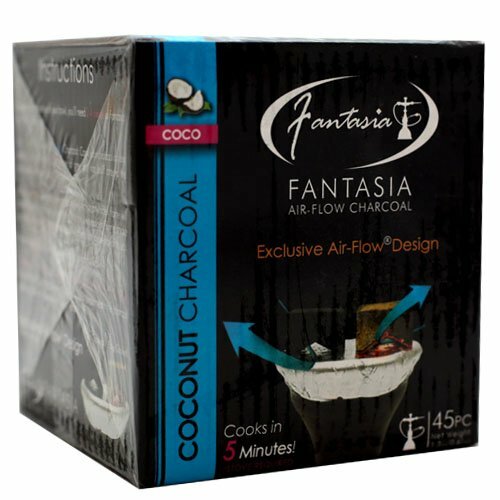 The makers of fantasia hookah tobacco have released their own brand of coconut hookah shisha coals manufactured in china, fantasia air flow coconut in the 45pc box are a patent pending innovative hookah coal that are lit in the same way as other coconut hookah charcoals (with an electric stove top, grill, or single coil burner). Once the coal is glowing red with no black showing, they're ready to be placed on your hookah bowl. What sets these coals apart from the other coconut hookah coals are they're not meant to be ashed off or rotated on the hookah bowl. The upside down "v" design elevates the heat and allows for oxygen to flow through the coal, keeping it stoked throughout your smoke. Even while ash accumulates around the coal, it does not need to be removed as it does not hinder its performance. They are all natural and do not contain any quick light chemicals, these accessories and parts are specifically designed for hookah smoking as they are odorless, tasteless, and chemical free. You can expect approximately 40 50 minutes of burn time per coal since these burn three times longer than most other charcoals on the market. If you have any questions about this product by Fantasia, contact us by completing and submitting the form below. If you are looking for a specif part number, please include it with your message.